A bid to save a visitor centre at an historic cathedral has been launched by a weekly newspaper. 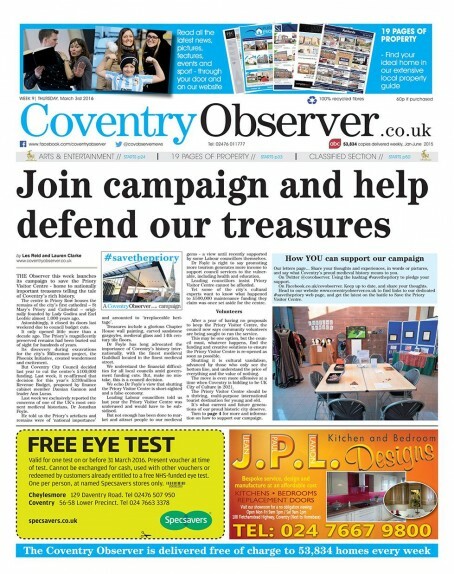 The Coventry Observer has begun its #SavethePriory campaign to try to keep the city’s Priory Visitor Centre open. The building, opened just 13 years ago, shows off the preserved ruins of Coventry’s first cathedral, St Mary’s Priory and Cathedral, and houses artefacts of significant historical importance. But Coventry City Council has decided to cut £100,000 worth of funding for the centre and close its doors to the public. It is feared the cuts could mean the centre is shut permanently. The campaign was launched on the Observer’s 3 March front page, pictured below. Observer news editor Lauren Clarke said: “The Observer is proud of Coventry’s rich history and could not just sit back while a gem like the Priory Visitor Centre and all it represents shuts – possibly forever. St Mary’s fell victim to Henry VIII’s dissolution of the monasteries in the 16th century, and was replaced by the building of St Michael’s Church. However, St Michael’s was bombed almost to destruction during the Coventry Blitz in the Second World War, and has itself been replaced as the city’s cathedral by a structure opened in 1962. What have the visitor figures been like for the centre in recent years? Is it really worth saving? £100,000 a year seems like a lot of money in today’s climate.